Birmingham Chiropractic Clinic is now providing state of the art, custom-made orthotics to support you in your chiropractic treatment. Poor foot mechanics can cause foot pain and unnecessary stresses further up the body, resulting in knee pain, back pain, and even neck pain. We have been referring those in need of orthotics to podiatrists for years. However, by working with industry leaders in orthotics – we can now offer this service in-house, and at a much more affordable price for you. Our Gaitscan system offer the most advanced method of analysing the distribution of force through the feet, whilst standing and walking. 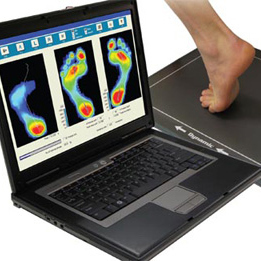 Recording over a million points of data, the scanning devices provide highly accurate readings of gait abnormalities. If you would like to book an appointment for a scan and have your own orthotics engineered, please call our reception on 0121 449 7766.